Former President Jimmy Carter was preparing to leave for North Korea on Tuesday to try to gain the freedom of an American imprisoned for illegally entering the communist nation, U.S. officials said Monday night. North Korea agreed to release Aijalon Mahli Gomes if Carter were to come to bring him home, a senior U.S. official told The Associated Press. Gomes, of Boston, who was arrested on Jan. 25 after entering North Korea, was sentenced in April to eight years in prison and fined $700,000. Carter was expected to spend a single night in North Korea and return with Gomes on Thursday, a second U.S. official said. Both officials spoke on condition of anonymity because of the sensitivity of the situation. As was the case when former President Bill Clinton went to North Korea last summer to win the release of two detained American reporters, no U.S. officials will travel with Carter, the senior official said. Carter spokeswoman Deanna Congileo and several other officials with the Atlanta-based Carter Center did not immediately return calls for comment. The magazine Foreign Policy first reported the Carter trip on Monday. 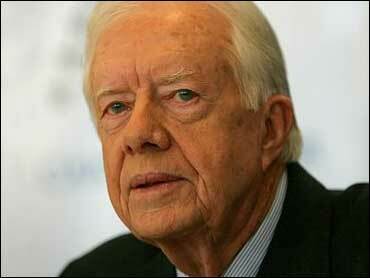 The senior U.S. official stressed that Carter was not representing the U.S. government. A State Department official, who would speak only without attribution, said the U.S. remains focused on securing Gomes' release. "If and when such a mission takes place, it will be private and for a humanitarian purpose," the State Department official said. State Department officials secretly visited North Korea in early August in what turned out to be a failed attempt to gain Gomes' release. U.S. officials have pressed for his freedom on humanitarian grounds, citing his health and reports that Gomes has attempted suicide while in custody. Why Gomes entered the North is unclear. He had been teaching English in South Korea before he was arrested in the North. Gomes' release has been complicated by tensions following the sinking in March of a South Korean warship, the Cheonan, in which 46 sailors died. The South and the U.S. have blamed the North for the incident, although the North has denied responsibility. In August 2009, Clinton traveled to Pyongyang to meet with North Korean leader Kim Jong Il and seek the release of two Current TV reporters, Laura Ling and Euna Lee, who were arrested after crossing into North Korea from China. They too faced trial and a long prison sentence but instead received a pardon from Kim and returned to the U.S. with Clinton. Carter, whose historic visit to North Korea in 1994 led to a landmark disarmament agreement, said last March that sanctions against the nuclear-armed regime were unproductive. The North was unlikely to back down from a standoff over its nuclear weapons program, he added, unless the U.S. and South Korea would prove to the North's satisfaction that they harbored no hostile intentions toward it. While the disarmament accord Carter negotiated eased tensions, it fell apart in 2002 after President George W. Bush called North Korea part of an "axis of evil."